Today's photo is another stop on our tour of small-town Montana bars and their great old signs. 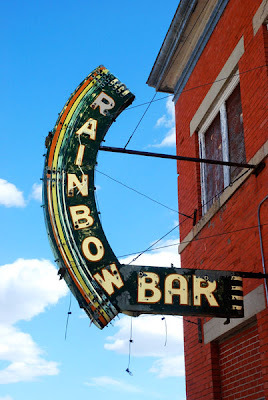 The Rainbow Bar is located in the tiny Fergus County town of Hilger, in a building that long ago housed the local bank. The neon tubes on this sign have probably been broken for decades, but it's still a very handsome addition to the central Montana landscape. The Rainbow Bar in Hilger...!! The earliest memories of my life are centered around that bar!! Drunk cowboys, grils in jeans, booze flowing freely...crowds, etc. I get the idea that both my mom and the man with her would work on busy nights...and my "sitters" were the people who crowded into the bar. I think I shamelessly enjoyed all the attention. My dog..Pete...was my constant companion in and around the Hilger area (which ain't much!!! )...one story I still tell is of the slightly drunk guy who wanted to pick me up...and Pete, growling, interceeding...My Mother had to call the dog off!!! Wow, what are the odds? That's extremely cool, and I loved hearing your reminiscences. Thanks so much for sharing them. I spent some of my elementary-school years in Challis, Idaho, a town of about 700. Small towns are perfect places to be a little kid, although I'm not sure I'd appreciate it quite as much as a teenager or grownup. Hilger has two bars these days -- the Rainbow and the Pioneer. (The Pioneer is newer, so I'm sure you would have been at the Rainbow.) For a long time the Rainbow was THE place to go in town, but when I drove through this spring all the pickup trucks were parked in front of the Pioneer. I heard that one of the people who ran the Rainbow died last winter.